Middle College High School students at Vol State have some interesting things on their minds and now you can take a listen to those thoughts via entries to a National Public Radio (NPR) podcast contest. 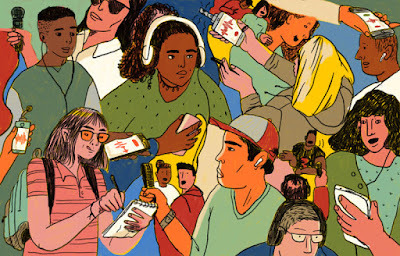 The NPR Student Podcast Challenge encouraged students to create podcasts on the topics of their choice. They received 5,700 entries, from all 50 states, and the District of Columbia. Many Vol State Middle College students created podcasts with help from faculty members Jamie Fuston and Steve Bishir. The entries were ranked and the six finalists were sent to NPR. Topics ranged from auditory induced brain stimulus to the concept of Middle College itself. They reviewed a short story and discussed mental health stigma. One group uncovered news stories ignored by the traditional media, including Muslim internment camps in China. Another group took a closer look at how music effects the brain. The winners of the NPR contest will be announced soon. There is one category for middle school students and another for the high school students. In the meantime, we encourage you to take a listen. The Middle College podcasts are informative and entertaining. You can listen to them here on Soundcloud. Best of luck to all of the contestants. We’ll have another story this week to talk a bit with the students about their experience.